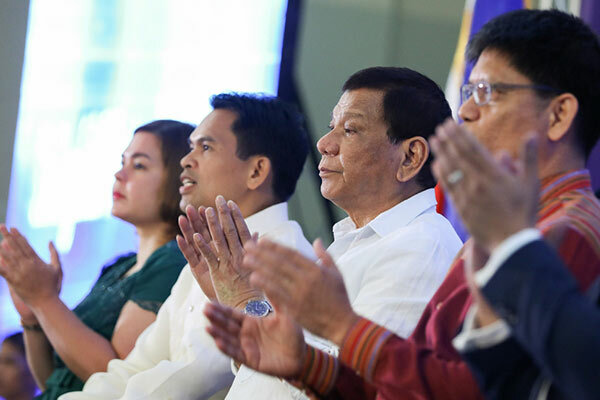 POLITICAL TIDBITS: In his address before the Integrated Bar of the Philippines, Davao Chapter, President Duterte was caustic and angry one moment, and philosophical and musing the next. He invited Morales and Sereno to resign with him, next moment he stressed that it will have to be the army/PNP to cause him to resign or stay. In his address before the Integrated Bar of the Philippines, Davao Chapter, President Duterte was caustic and angry one moment, and philosophical and musing the next. He invited Morales and Sereno to resign with him, next moment he stressed that it will have to be the army/PNP to cause him to resign or stay. I stayed up late a few nights ago listening to a re-broadcast of President Duterte in a long rambling speech at the Davao SMX Convention Center, during the oath-taking of new members of the Integrated Bar of the Philippines, Davao Chapter. He ranted and raved in a monologue for what seemed like two hours, during which the lawyers about to take their oath were largely stony silent---not knowing how to react perhaps to some of the things he was saying. Just stony silence, punctuated once in a rare while by some applause. Mr. Duterte peppered his ramblings with the usual curses, which the broadcasters sought to soften by papering it over with some visual effects or rendering some utterances garbled; hence that night the studio technicians were the busiest folks in Davao City. What seemed to irritate the President most---quite understandably---was an earlier suggestion from Ombudsman Conchita Carpio Morales, and upheld by IBP National President Abdiel den Elijah Fajardo, that Mr. Duterte should not be “onion-skinned.” It's interesting to note that the Ombudsman is the sister of Mr. Duterte’s "balae" (the father-in-law of Davao Mayor Sara Duterte). Thus, Morales' admonition to the President not to be "onion-skinned" must be particularly irritating, considering that they are really just one family. Mr. Duterte vehemently objected to the allegations raised by Morales about possible bank accounts here and abroad owned by the Duterte family. But Mr. Duterte’s arch-critic, Sen. Antonio Trillanes, had hurled the challenge to the Ombudsman to scrutinize those supposed accounts, and under the rules of her office, she was duty-bound to look into these allegations of hidden wealth. But the President stressed that he will not submit to the jurisdiction of the Ombudsman. The President stressed that all that’s being raised about hundreds of millions of pesos allegedly in his bank accounts are pure lies. It was at this point that the President raised the proposition that the three of them RESIGN together, simultaneously---he, the Ombudsman and Chief Justice Maria Lourdes Sereno. He challenged the two highest women officials to go to Congress---“the three of us---and let us sign letters of resignation." Mr. Duterte stressed that the Anti-Money Laundering Council (AMLC) has denied releasing any documents about his funds; hence, he said, the figures being bandied around by Morales and her staff were pure fabrication. Here Mr. Duterte seems to reserve his biggest ire for Deputy Ombudsman Melchor Arthur Carandang, who, he asserted, has given the Filipino public the impression that the AMLC had shared pertinent documents about his alleged bank accounts, when, in fact, thundered Mr. Duterte, Carandang, under tremendous duress, later admitted that he got the figures only from media. A while longer into the presidential monologue in the Davao SMX Convention, he retracted his earlier offer to the two most powerful women he was at odds with, to resign with him. “I will not resign,” he said categorically. But who will decide on the issue of the leadership of the country? Duterte said without hesitation: it will have to be the Police and the Armed Forces. And to Deputy Ombudsman Carandang he had a parting shot: "Pag nagka-leche leche ang Pilipinas, uunahin kita (If something happens to the Philippines, I will make sure I’ll get you first).” And as though for emphasis, Mr. Duterte said: Ilang pulis dito ang binimbang ko, ang ilan ay sinampal ko. He did not spare the family that had owned the Inquirer for some 25 years. Said the President: Any amount collected from government property should be surrendered to the government. "Kayo pala ang magnanakaw, i-surender na ninyo ang property na yan at gagawaan ko ng bahay iyon para sa mga mahihirap." His parting shot to the Inquirer owners: You who have enjoyed the fat of the land, time to go. The president of Philippines are so dedicated and honest with his country and have taken so many important steps for the welfare of his public.